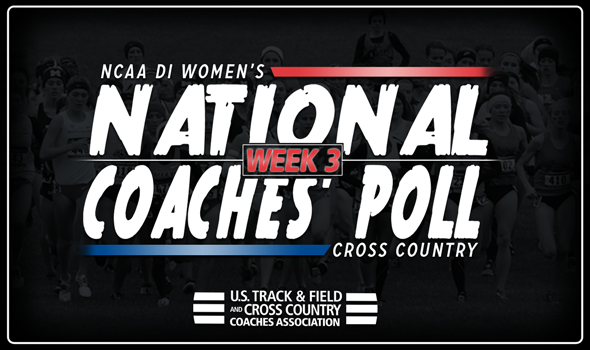 NEW ORLEANS – After a relatively light weekend on the national cross country circuit, the third week of the U.S. Track & Field and Cross Country Coaches Association (USTFCCCA) NCAA Division I Women’s Cross Country National Coaches’ Poll – released on Tuesday – saw the top-five teams remain in position from a week ago. Colorado (first), Oregon (second), New Mexico (third), Michigan (fourth) and Stanford (fifth) were all idle on the week, and therefore held down the top-five spots in the polls for the second-consecutive week. The Buffaloes, Ducks and Cardinal have been first, second and fifth, respectively, in all four polls on the season, while the Lobos and Wolverines entered their respective slots in the rankings after the first week of action. Outside of the top-five, the remaining 25 teams in the polls played Chutes and Ladders with one another, with all but two teams moving either up or down in the rankings. San Francisco made the biggest jump within the top-10, moving up two spots to sixth on the heels of its win at the Roy Griak Invitational. Weronika Pyzik won the race with a time of 21:09.2, and was immediately followed across the finish line by teammates Charlotte Taylor (21:11.4), Isabelle Brauer (21:28.1) and Marie Bouchard (21:30.3) to give San Francisco the fewest points by a team champion at the meet since Villanova in 1989 (20). The ranking in the national polls is the highest in Don’s history. N.C. State and Providence each fell a spot to seventh and eighth, respectively, while Penn State and Arkansas are tied for ninth to round out the top-10. Boise State (13th) and Indiana (14th) gained ground in the polls, with the latter of the two teams having finished second to Providence at the Coast-to-Coast Battle of Beantown this past weekend. The Hoosiers continue their climb in the rankings after having entered the polls in week one at 26th before moving up to 18th a week ago. Iowa State made a significant leap to 17th after a second-place finish at the Roy Griak Invitational. The Cyclones were led by Cailie Logue (fifth) and Anne Frisbie (sixth) in that race. Vanderbilt also made a solid jump, moving from 29th to 25th. Furman also returned to the rankings at 29th. A lot will happen between now and the 2017 NCAA Division I Cross Country Championships on Nov. 18 at E.P. “Tom” Sawyer State Park in Louisville, Kentucky. Check back at www.ustfccca.org for updates throughout the season.